Tea Tree oil (TTO) is known to have antibacterial effects and this study was aimed to determine the abilities to control pathogenic bacteria and also compared the antimicrobial effectiveness of Eucalyptus oil (ECO), Lemongrass oil (LGO) and antibiotics those are using for bacterial infection. This study of antimicrobial activity against ten pathogenic bacteria: Staphylococcus aureus, Streptococcus pyogenes, Pseudomonas aeruginosa, Proteus vulgaris, Aeromonas hydrophila, Escherichia coli, Streptococcus pneumoniae, Bacillus subtilis, Klebsiella pneumonia and Streptococcus agalactiae was done by Broth dilution method and Agar well diffusion method. The essential oils used in this study were commercially available. The inhibition of bacterial growth after 24 hours incubation exhibits greater results than 6 hours incubation in most of the cases. After 24 hours incubation, TTO showed minimum 96.94% against E. coli and maximum 100% inhibition against seven bacteria selected for this study whereas ECO showed minimum 37.02% against E. coli and maximum 100% inhibition against S. aureus, P. vulgaris and A. hydrophila and the another essential oil that is LGO exhibited minimum 69.08% against E. coli and maximum 100% inhibition against five bacteria chosen for this study. The inhibition zones from each extract were measured and an activity index was calculated from the mean zone sizes. All Essential oils showed some degree of antimicrobial properties with the highest activity index (1.6) being from TTO against S. agalactiae. At last, established a comparison between tea tree oil and some broad spectrum antibiotics using well diffusion method. 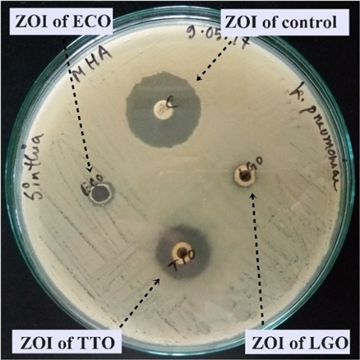 Tea tree oil exhibited observable zone against all the bacteria contrariwise, among nine antibiotics only two of them showed noticeable zone of inhibition to all the bacteria tested. According to this study, TTO has demonstrated remarkable antibacterial activity which was more efficient than ECO and LGO and, moreover, it is expected that TTO will gradually take place of conventional antibiotics to treat bacterial infection. Schneider, E.K., Ortega, F.R., Velkov, T., Li, J. Antibiotic–non-antibiotic combinations for combating extremely drug- resistant Gram-negative ‘superbugs’. Essays In Biochemistry, 2017; 61 (1): 115. Moskvitch, K. (2015, January 28). How to Solve the Problem of Antibiotic Resistance. Retrieved November 14, 2017, from https://www.scientificamerican.com/article/how-to-solve-the-problem-of-antibiotic-resistance/ . Essential oils used in aromatherapy: A systemic review. (2015, July 10). Retrieved November 14, 2017, from http://www.sciencedirect.com/science/article/pii/S2221169115001033?via%3Dihub. Milhau G, Valentin A, Benoit F, Mallie M, Bastide J, Pelissier Y, Bessiere J. In vitro antimicrobial activity of eight essential oils. J Essent Oil Res. 1997; 9: 329-333. Darokar MP, Mathur A, Dwivedi S, Bhalla R, Khanuja SPS, Kumar S. Detection of antibacterial activity in the floral petals of some higher plants. Curr Sci. 1998; 75: 187. May, J. (2000). Time-kill studies of tea tree oils on clinical isolates. Journal of Antimicrobial Chemotherapy, 45(5), pp.639-643. 13 Uses For Tea Tree Oil That Will Change Your Life. (2017, April 05). Retrieved November 14, 2017, from http://www.naturallivingideas.com/tea-tree-oil-uses/. Benefits Of Eucalyptus Oil. (n.d.). Retrieved November 14, 2017, from http://www.lisasfragrancensuch.com/apps/blog/show/43944925-benefits-of-eucalyptus-oil. Herbal Oil: Eucalyptus Oil Benefits and Uses. (n.d.). Retrieved November 14, 2017, from https://articles.mercola.com/herbal-oils/eucalyptus-oil.aspx. Boldt, E. (2017, August 25). What is Lemongrass Essential Oil Good For? Retrieved November 14, 2017, from https://draxe.com/lemongrass-essential-oil/. Ali B., Al-Wabel N. A., Shams S., Ahamad A., Khan S. A., Anwar F. Essential oils used in aromatherapy: a systemic review. Asian Pacific Journal of Tropical Biomedicine. 2015; 5(8): 601-611. Fitzpatrick, M. (February 17, 2010). Antimicrobial action of tea tree oil (Melaleuca alternifolia) on five common bacteria. Carson, C.F., Hammer, A., Riley, T.V. (2006). Melaleuca alternifolia (Tea Tree) Oil: a Review of Antimicrobial and Other Medicinal Properties. Clinical Microbiology Reviews, Jan. 2006, p. 50-62. Carson, C.F. and Riley, T.V. (1995). Antimicrobial activity of the major components of the essential oil of Melaleuca alternifolia. Journal of applied bacteriology. 78 (3), 264-269. B.B. Aggarwal, H. Ichikawa, P. Garodia, et al. From traditional Ayurvedic medicine to modern medicine: identification of therapeutic targets for suppression of inflammation and cancer. Expert Opin Ther Targets, 10 (2006), pp. 87-118. Lee, C., Chen, L., Chen, L., Chang, T., Huang, C., Huang, M. and Wang, C. (2013). Correlations of the components of tea tree oil with its antibacterial effects and skin irritation. Journal of Food and Drug Analysis, 21(2), pp.169-176. Cox, S., Mann, C., Markham, J., Bell, H., Gustafson, J., Warmington, J. and Wyllie, S. (2001). The mode of antimicrobial action of the essential oil of Melaleuca alternifolia (tea tree oil). Journal of Applied Microbiology, 88(1), pp.170-175. Wilkinson, JM, Cavanagh HM. Antibacterial activity of essential oils from Australian native plants. Phytother Res 2005; 19: 643-6. Hammer, KA; Carson, CF; Riley, TV; Nielsen, JB (May 2006). “A review of the toxicity of Melaleuca alternifolia (tea tree) oil.” Food and Chemical Toxicology. 44 (5): 616-25. Pazyar, N; Yaghoobi, R; Bagherani, N; Kazerouni, A (July 2013). “A review of applications of tea tree oil in dermatology”. International Journal of Dermatology. 52 (7): 784-90.